It’s been a busy weekend on the Internet. 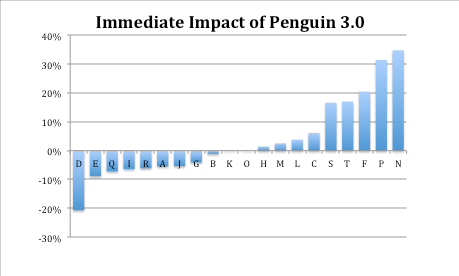 Friday, internet-dwellers became aware of a long awaited Google algorithm update, Penguin 3.0. Mockingbird Marketing will be hosting a Webinar, Tuesday, October 28th at 1:00 PDT to help you self-diagnose if Penguin 3.0 has impacted your site and what to do about it if it has. Webinar Signup: Penguin 3.0 Diagnosis for Law Firms. Google told us this was coming (we wrote about it last week), and here at Mockingbird we’ve been anxiously awaiting it’s arrival. Penguin is an algorithm update first released in 2012 that aims to put the hurt on sites with spammy backlinks. It’s a particularly interesting update because it appears that if Penguin has penalized a site, no matter how much backlink cleanup you do, the site won’t be able to recover until the next update. Considering the last update was over a year ago, a lot of sites have been sitting in limbo for a long time. We ran a quick study this morning on our clients, looking specifically at our top 20 clients with the most traffic. To see how Penguin affected our clients, we compared the natural traffic average of the four weekends prior to the natural traffic this past weekend. If this pattern holds (and thats a big if – we’re dealing with just two days of data here) – 25% of the sites saw a increase of more than 15% and one got hammered. For the most part, to our delight, our clients faired well – with a quarter seeing a large boost and only one getting hit. A few clients experienced a huge increase in traffic. Uncoincidentally, we’ve spent a ton of time cleaning up the spammy efforts of previous agencies to sanitize the backlink profiles of these sites. Filter your Google Analytics data to only show organic traffic. Get your average traffic for the past four weekends (or if you can wait until Friday, the past four weeks). Compare this number to your traffic this past weekend. Take it all with a grain of salt, and consider what else is going on. Did you just re-launch your site? Have you been experiencing a steady decline in traffic for a while? And also remember – your best bet is to wait for at least a week to see a clear picture. Cheer, cry, or shrug, depending on your results. If you have a website and you or someone on your behalf has ever done less-than-white-hat link building, keep a close eye on your traffic. If it takes a turn for the worse, there’s a good chance you are feeling the force of this Penguin smack down. If you want to learn if the Penguin update affected your site, tune into our Webinar Tuesday, October 28th at 1:00 PDT. Good Advice! Noticed that there’s a lot of sites like SEmalt that throw off analytic data. Had only one client that was negatively effected by the update. That’s what happens when you have enemies that link viagra pills and cialis. We picked them up right when the update was released. Proud to say they have been successfully recovered.